It has been unusually cold in North Carolina, with temperatures in the 30s and snowfall in early December! 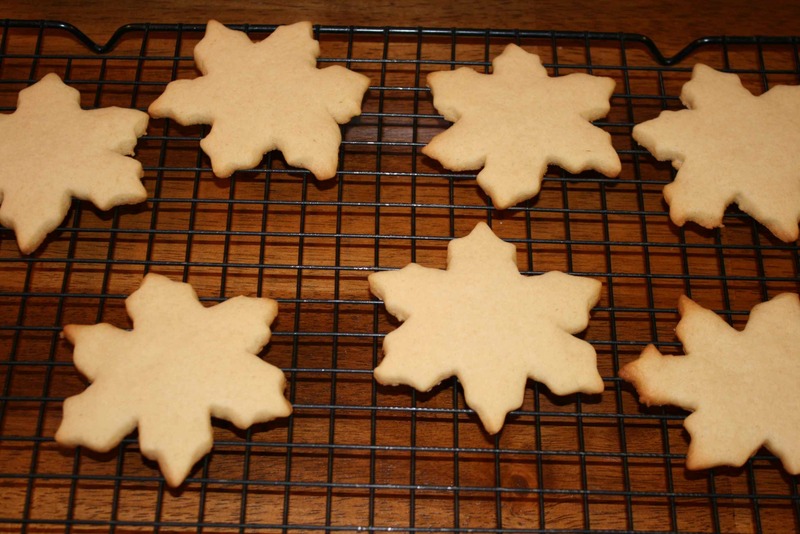 Very strange, but also a perfect setting for these gorgeous snowflake sugar cookies. Of course, after my notorious Cookie Fail, I relied heavily on Betsy’s cookie expertise for this batch of cookies. We started with a basic sugar cookie recipe. After a lot of practice, we got in a good rhythm: Betsy is good at rolling and cutting, and I’m good peeling and placing on the pan. I usually am not big on purchasing specific kitchen tools that do fancy things because I think most baking can be accomplished with basic kitchen items, but I will say that the large spreader from Pampered Chef came in handy. 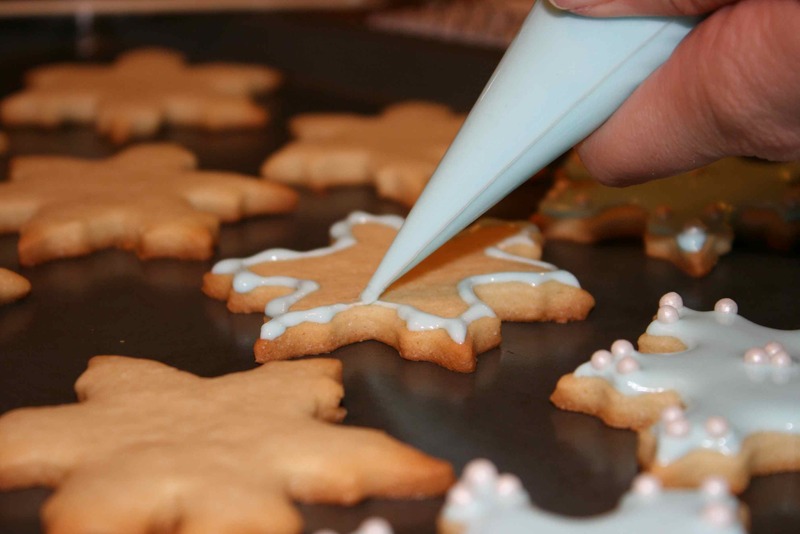 It’s designed to be used to spread icing on large cakes, but it worked really well to slide delicate snowflake shapes off the counter top and get them to the baking pan. Just flour it a little and it works like a charm. After baking and cooling about 6 dozen cookies (yes, it took forever), I set about with decorating (which took another forever). We whipped up a batch of royal icing and added some whitening cream to make it extra-white, instead of kind of a dull, unappealing cream color. Betsy loaded it into an icing bag with a tiny tip for me, and I got to work. 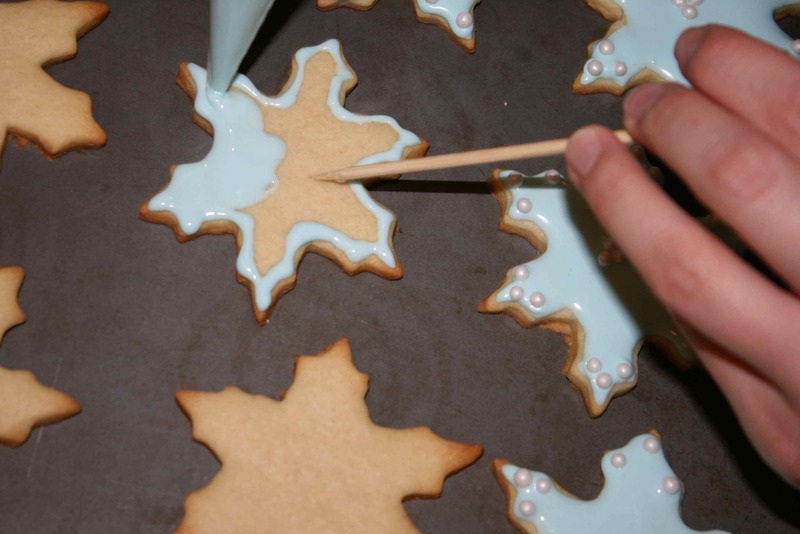 Royal icing hardens into a solid layer when it comes in contact with air. It takes a few hours for it to harden completely, but it gets difficult to spread evenly within minutes. So working relatively quickly, I did one cookie at a time. To make sure I got a neat overall cover, I first traced the snowflake outline and then filled it in. I held it still with a wooden skewer so I could move a little more quickly. Then, using a pair of tweezers, I added light blue sugar pearls. 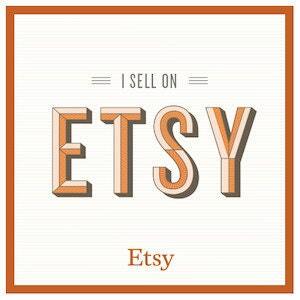 Play around with different patterns and get creative — it’s fun! I made two different patterns with the white icing. Then we made another batch of royal icing and colored it with light blue dye and a little bit of whitening to lighten it to the right shade. 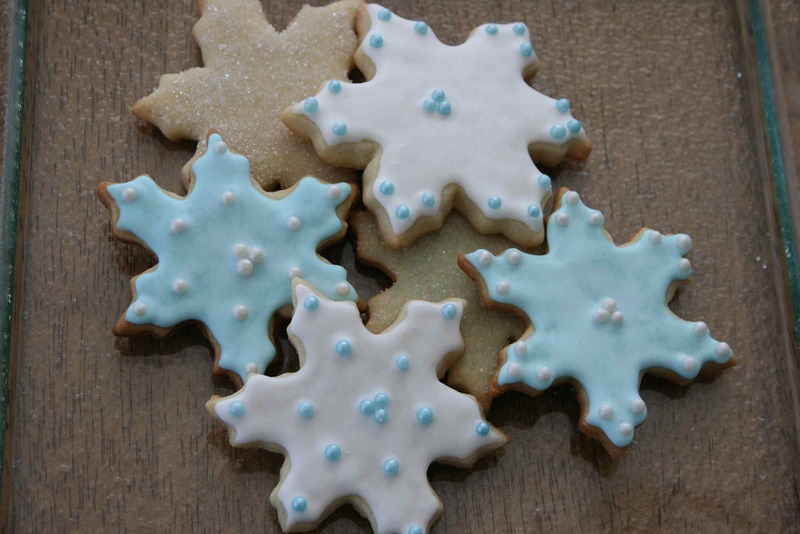 I decorated another 2 dozen cookies with the same patterns as the white cookies, but with light blue icing and white sugar pearls. While I worked on those, Betsy decorated the rest of the cookies with sugar sprinkles. For a dozen cookies, she used a paintbrush to coat each cookie with a layer of piping gel, which only looks disgusting. Then she poured silver pearlized sugar on top, and that’s it! Quite simple. 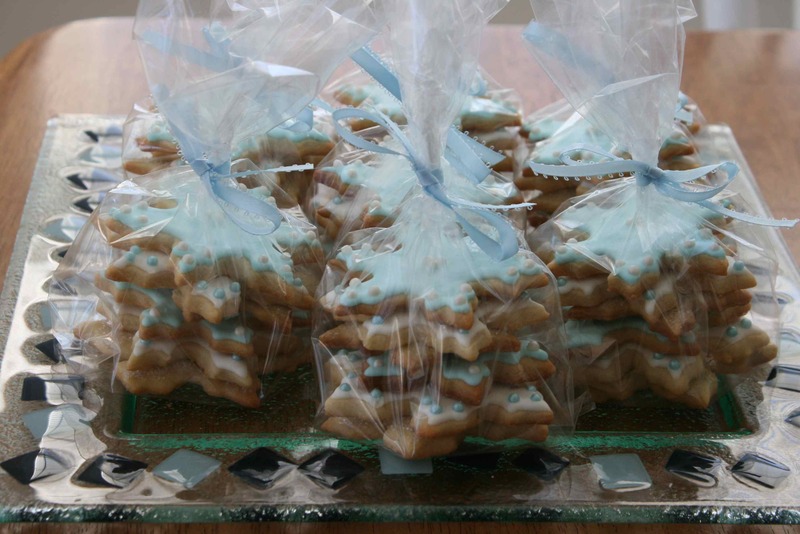 For another dozen cookies, we wanted them to be blue, but the blue pearlized sugar was way to bold next to the light blue royal icing. So Betsy mixed a little blue food coloring into the piping gel and then decorated it the same way — paint it on the cookie and then cover with silver sprinkles. It gave a very pale blue shine, almost like glass, underneath the silver sprinkles. Very subtle and beautiful! 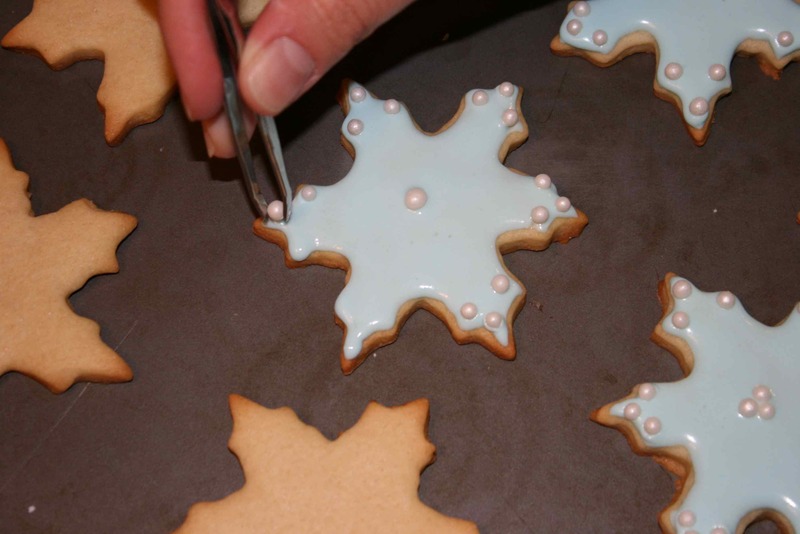 After the white cookies hardened completely, Betsy used a large paintbrush (you could also use a blush brush or kabuki makeup brush) to dust on some silver pearl dust. It’s like using glitter makeup with a slight sparkle to it — it’s barely noticeable but adds a nice little sparkling sheen to the cookie. So this was a relatively short post compared to the others, but don’t think this is a relatively short process. Cutting cookies takes longer than filling a bunch of cake or cupcake tins, and decorating cookies like this — especially with a complicated cookie shape — takes a long time. All in all, this took us about 6 or 7 hours. And that doesn’t count the packaging and presentation time. 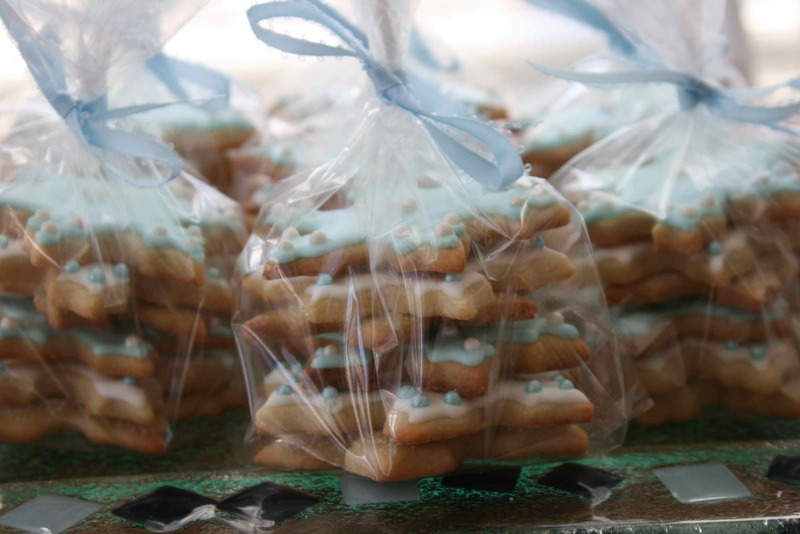 When I got home, I loaded 6 cookies — one of each decoration type — into clear plastic bags I picked up at Michael’s, twisted the top closed, secured it with tape, and tied it with a blue ribbon. They made adorable gift bags! The cookies look wonderful. I would have thought they were a bakery purchase. Susie and Betsy, you make a great team.